BURNABY, B.C. -- The RCMP arrested protesters Thursday as officers enforced a court injunction to dismantle a protest camp and snuff out a sacred fire at a site where the Trans Mountain pipeline ends in Burnaby, B.C. "Five were subsequently arrested and have since been released from custody," the post said. Police said in a news release that a family of three living at the camp was being helped to acquire emergency shelter. "The folks agreed to sign the terms and they were released," she said in a phone interview. That deadline passed Sunday and protesters at the camp said Monday they were prepared to protect a sacred fire, which has been burning since the camp was set up late last year. They also said they planned to tie themselves to structures rather than obey the injunction. B.C. Supreme Court Justice Geoffrey Gomery was specific in the injunction that the fire needed to be put out because it was burning in dry conditions near an aviation fuel tank farm. "Our paramount concern is safety," said Panesar. "We ensure that everybody is out of the exclusion zone and then the City of Burnaby can come in and start cleaning up the protest site." Dipak Dattani, Burnaby's acting city manager, said crews were doing an inventory of any personal property, as well as of the structures on the site. "Once that is done, we will then start looking at dismantling. To give you a date or time, it's hard for me to say right now because we just got on the site." The nearby Indigenous protest site wasn't included in the injunction application. "The city asked it to be removed so there was a proper ceremony with Indigenous elders and (the sacred fire) was removed until after the fire ban," Berman said. 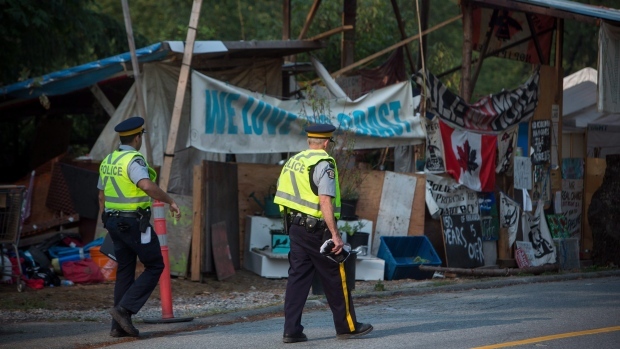 RCMP said that since March they've arrested 217 people under a court-ordered injunction that restricts protesters from within five metres of sites in Burnaby where work related to the pipeline expansion is underway. It has also become a rallying point for demonstrators opposed to the pipeline's expansion, which would more than triple the amount of bitumen and other oil products moving from near Edmonton to Burnaby for shipping overseas by tanker. BURNABY, B.C. -- The RCMP arrested protesters Thursday as officers enforced a court injunction to dismantle a protest camp and snuff a sacred fire at a site where the Trans Mountain pipeline ends in Burnaby, B.C. The camp grew to include two-storey structures, several vehicles and a make-shift shower. It has also become a rallying point for demonstrators opposed to the pipeline's expansion, which would more than triple the amount of bitumen and other oil products moving from Edmonton to Burnaby for shipping overseas by tanker.